Nokia has started to announce the new Nokia N920 mobile phone similar to Nokia N900. Nokia N920 plan will have the latest operating system from Maemo version 6. Nokia mobile phone sales success in the market, making the largest telecommunication equipment manufacturers in the world never stop developing the technology in every product. As did the latest phones Nokia N920 by presenting a plan smart phones will have the latest operating system version of the Maemo 6. Nokia N920 does look like the Nokia N900, only the size of the Nokia N920 looks much thinner than the Nokia N900. Because the Nokia N920 provides a full screen 4.13-inch touchscreen and keyboard is not accompanied by a slide like the one on the Nokia N900. In addition, Nokia also promises great performance and features that are not less interesting, as the smart phone on the market. Starting from WiFi, Bluetooth, GPS and so on. Although so far Nokia has not given detailed specifications offered Nokia N920, but Nokia make sure that they also will give the best performance and attractive features such as the Nokia N900. Until now, we have not managed to get information about what plans Nokia N920 price. But according to the explanations derived from one source, the price of the Nokia N920 is not much different with Nokia N900. Because the Nokia N920 is a mobile thin version of the Nokia N900. The plan, Motorola will make a campaign for this new phone at the Mobile World Congress exhibition that was held in February 2010. 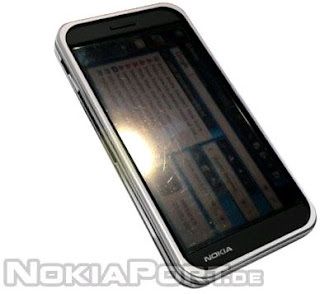 Seeing this, the new Nokia N920 will be present on the market in mid 2010.